TAKARA-TOMY released this set on March 31st, 2012 for approximately 2625 yen. 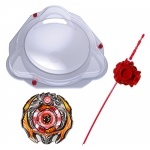 This Set constitutes a good introduction to Metal Fight Beyblade Zero-G. The Zero-G Stadium Attack Type is an excellent arena for the swaying gimmick of this system, but it can be found individually and the other types of Zero-G Stadiums make good alternatives, as opposed to the dominance the BeyStadium Attack Type imposes on all other stadiums released in Metal Fight Beyblade classic gameplay. Samurai Ifraid Burning Ver. offers an interesting recolour, and the majority of its parts have competitive use in Attack (Ifraid and CF), Zero-G Attack (CF) and Stamina (W145). Consequently, this Set should be purchased if found at a lower price than the sum of its contents' prices. This page was last modified on 18 June 2013, at 00:00.